Whether you have a fireplace or stove, be sure to have a professional inspection every year by a chimney sweep who is certified by the Chimney Safety Institute of America to ensure fireplace safety. Allow yourself time for any cleaning and repairs that might be needed. The biggest risk of an uncleaned chimney or flue is creosote, a highly flammable residue. If it ignites, the resulting high heat can damage mortar and masonry, creating a potential pathway for fire to reach the wood structure of your home. Your wood stove should be the right size for the space you intend to heat, because firing it at too high or too low a temperature can cause problems ranging from poor fuel efficiency to fire risks. The Cornell Cooperative Extension recommends using a stovepipe thermometer (which is inexpensive and simple to install) to help you easily check the temperature and ensure fireplace safety. Do not leave your fire unattended, and use a fireplace screen to prevent flying sparks or embers from landing on flooring, carpets, or objects near the hearth. Small children and pets should be closely supervised around fireplaces and wood-burning stoves. You might even consider installing a barrier such as a small fence around your stove to keep children and animals out of harm’s way. For basic fire safety, be sure to install smoke detectors throughout your home. You can find many different types of smoke alarms today, so shop around for the option that fits your home and personal needs. For example, alarms with strobe lights and bed shakers are a great option for people who have difficulty hearing. Aim low, at the base of the flames. Sweep the nozzle back and forth. One last tip: if you are thinking about buying a wood stove, pay special attention to the labels when you shop. You should see either an Underwriters Laboratories (UL, an independent safety organization) or a National Fire Prevention Association (NFPA) label. In addition, the U.S. Environmental Protection Agency (EPA) published new standards for wood heaters in 2015 that limit the emissions released, and any wood heaters that are sold at retail must be certified as compliant with these standards. You can check the EPA’s website for a list of certified wood stoves. Note that setting up the flue properly can be tricky, so professional installation is recommended. 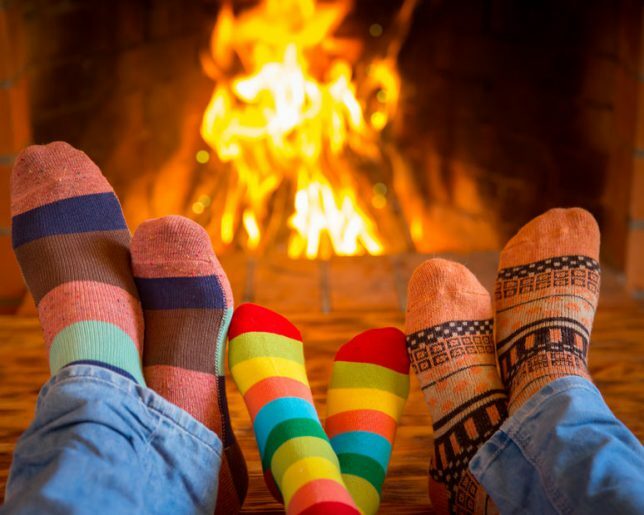 With these simple precautions, your family will be able to safely enjoy a warm, cozy fire this winter. Do you need help with fire damage repair? If your home has suffered fire damage, a qualified house fire restoration contractor can provide cleanup services and help restore your home to its original condition. To receive a free, no-obligation estimate from a qualified contractor in your area, please enter your ZIP code above. Every contractor in our network has already been vetted, and offers our exclusive, three-year warranty on workmanship.